“Wow! You really thought of every little detail.” — Cool counter lady at the Ferndale City Hall permit counter. With that comment, I knew getting approved for the chicken coop permit was a done deal. And thank goodness. With all the planning and worrying, my nerves were shot! I’m glad to report that the counter lady had provided some faulty information, which really worked out in my favor. Instead of waiting two to four weeks for the site plan approval, an employee in the permit office approved my plan as soon as she looked it over. The permit (which cost $35) is good for a year. Now, Matt and I will focus on buying all the building materials. From the research I’ve done, it should cost between $600-$1,000 to build the Wichita Cabin Coop. Our friend Eric said he could help us build in October, so Matt and I have a few weeks to gather all the materials. While filing the paperwork, my address was added to the front of a folder for Ferndale residents who got chicken coop building permits. Using my journalism superpower to read upside down, I quickly counted the entries. 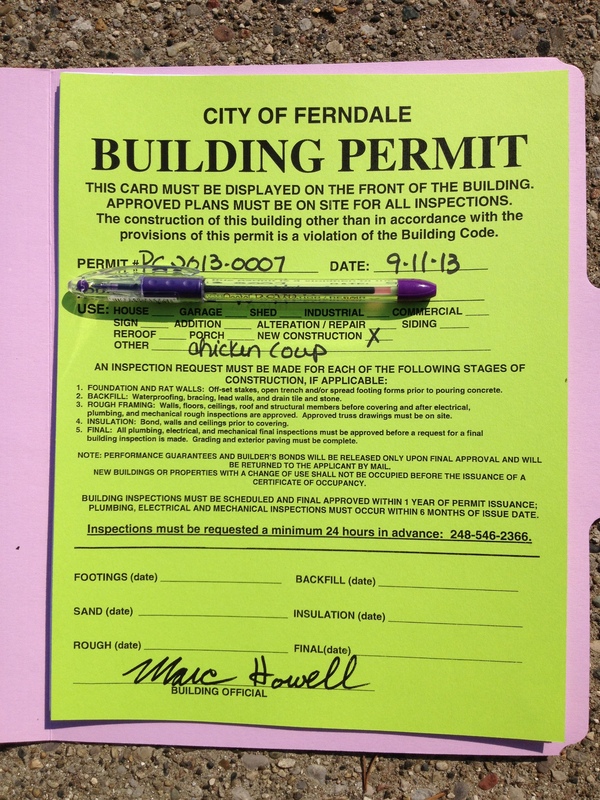 I am officially the 10th Ferndale household to get a building permit for a chicken coop. I asked how many actually completed coops, but didn’t get an answer. Oh yes. This is feeling real.